This accident involved two avalanches. The first was a hard slab avalanche unintentionally triggered by the group of skiers, medium sized relative to the path, and had the destructive force to bury, injure, or kill a person (HS-ASu-R2-D2-O). The group triggered the avalanche near a shallow, rocky outcrop. It likely broke on a buried layer of near-surface facets that developed between storms during the first few days of the year. The avalanche stepped down to deeper weak layers near the ground, entraining the entire season’s snowpack. The face of the crown ranged from 12 inches to 54 inches deep. The avalanche released on a south-southeast facing slope around 32 degrees in steepness. A crack from the first avalanche ran through the snow, releasing a second avalanche (remote trigger) on a connected east-facing slope. The second avalanche was a hard slab, medium sized relative to path, and had the destructive force to bury, injure, or kill a person (HS-ASr-R2-D2-O). Investigators estimated that the average depth of the crown face was 36 inches. The avalanche released on a slope around 35 degrees in steepness. The debris from both slides overlapped at the bottom of the slope. Snow safety team triggered large avalanche breaking to the ground yesterday, and forecasters reported worrisome snowpack test results along the US 550 corridor. This provides clear evidence that you can trigger an avalanche breaking on buried weak layer today. You can trigger avalanches from the bottom of the slope, from adjacent slopes, or from a distance. 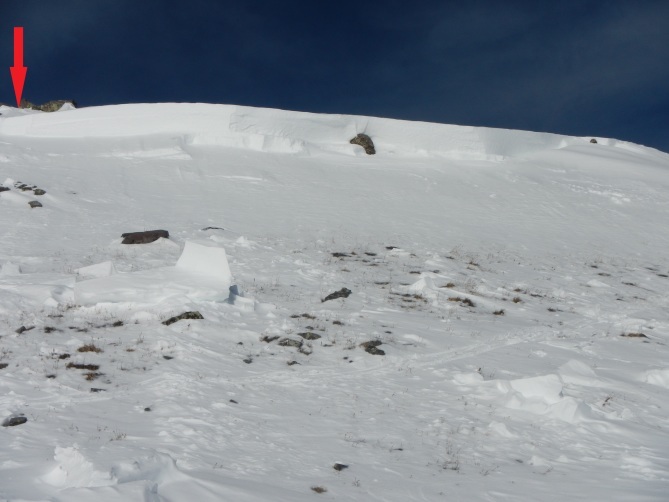 Cracking, collapsing, and recent avalanches are all signs of a dangerous snowpack. 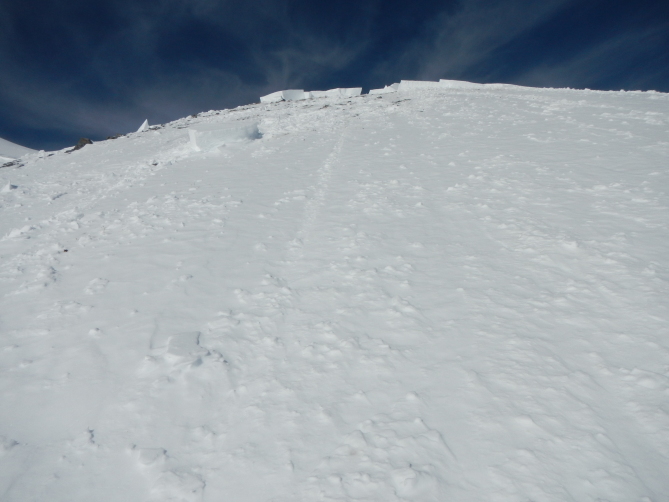 The most dangerous slopes are steeper than around 35 degrees, face west to north through southeast. 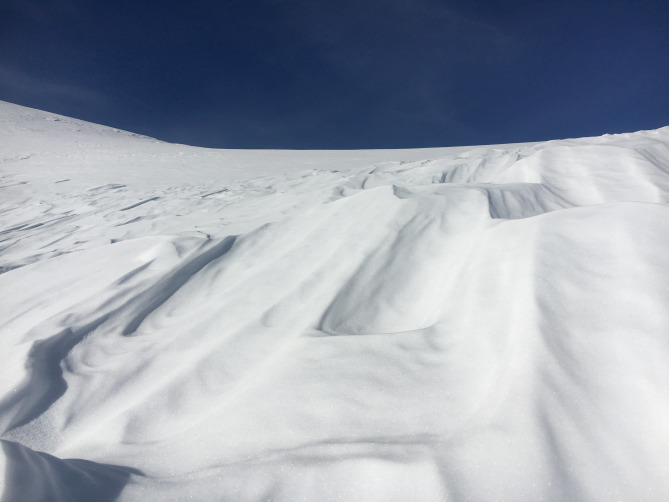 Look for signs of wind-loading like lens-shaped pillows and textured snow surfaces below ridgelines and along steep gully walls to identify suspect areas. You can find safer riding options at lower elevations where the slab is not present, on lower-angle slopes, and in areas sheltered from the wind. An incoming winter storm will bring snow to the area overnight and into tomorrow. Expect avalanche hazard to rise, and watch for rapidly changing conditions. The Colorado Avalanche Information Center (CAIC) maintains a snow study site at 11,070 feet on Red Mountain Pass, 1.5 miles east-southeast of the accident site. CAIC forecasters measured 9 inches of snow and 0.95 inches snow water equivalent (SWE) on New Year’s Day, the last day of measurable snow before the accident. In the two weeks prior to the accident, CAIC forecasters measured a total of 34.5 inches of snow with 2.6 inches of SWE. The Center for Snow and Avalanche Studies (CSAC) maintains the Senator Beck weather station at an elevation of 12,186 feet, in an alpine basin 0.75 miles southeast of the accident site. From the evening of January 2 until the morning of January 4, northwest winds averaged 15 to 25 miles/hour with gusts between 25 and 45 miles/hour. On the day of the accident, winds blew from the south-southwest between 5 to 15 miles/hour with a peak gust of 27 miles/hour. The weather station recorded a low temperature of 23F and a high of 32F. Skies were mostly clear in the morning, with cloud cover increasing through the day as a storm approached the region. Snowfall began by midnight on January 5, 2019. Ample snow fell in October and faceted during dry weather in mid-November. Slopes that face north and east above treeline held the most early season snow. Many south and west-facing slopes melted back to bare ground. A series of storms in late November and early December built layers of wind-drifted snow over a weak and cohesionless foundation. 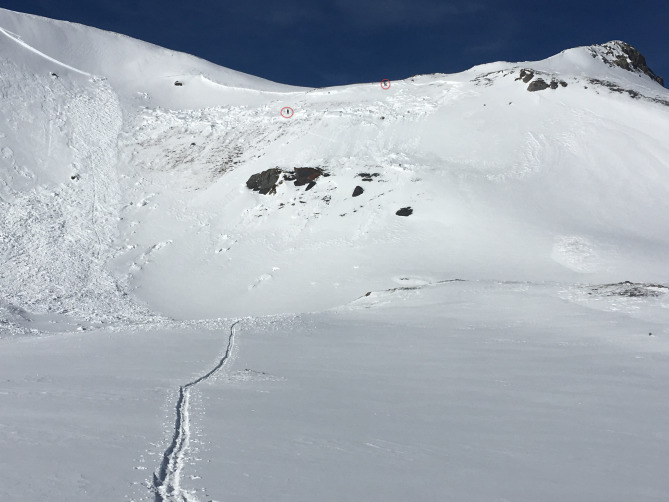 These storms contributed to a significant increase in avalanche activity in the North San Juan zone, and the CAIC documented 87 avalanches between November 22 and December 15. Subsequent dry and cold weather during the second half of December formed another layer of weak faceted snow near the snow surface. Significant snowfall began in late December and continued through the New Year. Up to three feet of snow accumulated in back-to-back storms. Storm snow and strong winds formed thick, stiff slabs and overloaded facets buried in the upper snowpack and depth hoar near the ground. 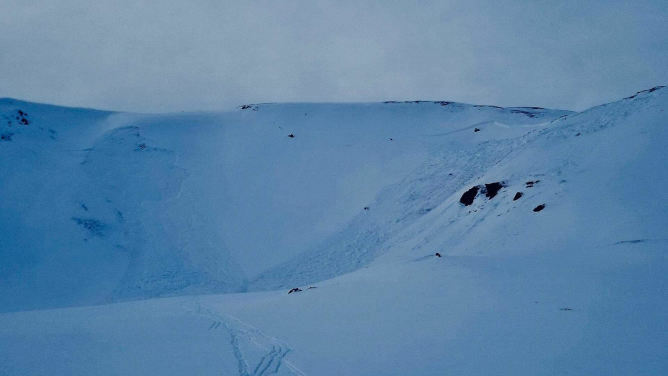 An avalanche cycle followed, and the CAIC recorded 72 avalanches between December 24 and January 4 in the North San Juan zone. The majority of natural and human-triggered avalanches occurred on north, northeast, east, and southeast-facing slopes. 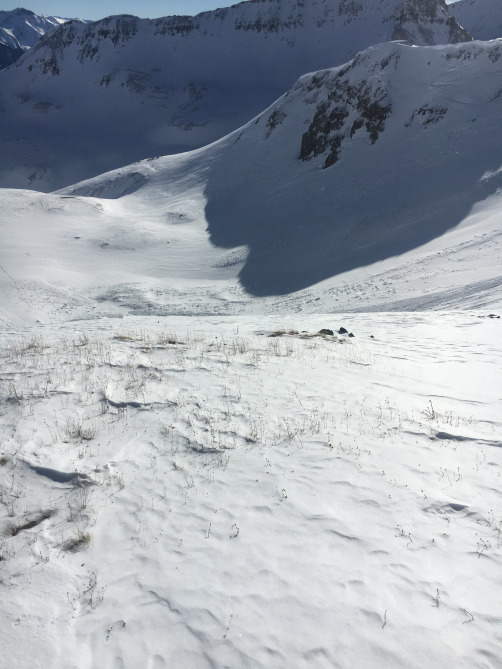 On January 3, a human-triggered avalanche resulted in a partial burial on a southeast-facing slope near Trico Peak, south of Senator Beck basin (Note: this accident was reported to the CAIC on January 6. Information about this accident was not available to the CAIC or the public on January 5). The group met the morning of Friday, January 4, at the beginning of an American Institute for Avalanche Research and Education (AIARE) 2 avalanche class at the Silverton Avalanche School (SAS). This is the second course in the recreational curriculum created by the AIARE. The class spent most of the day in Silverton. In the afternoon, ten students and two instructors went to the St. Paul Lodge near the top of Red Mountain Pass. Their plan was to spend the night at the lodge and Saturday in the backcountry. They planned to return to the lodge on Saturday night, and spend Sunday in the backcountry before the course ended on Sunday afternoon. Friday evening in the lodge, they divided into two groups. The instructors assigned each group a large section of terrain on Red Mountain Pass and asked them to plan a tour for the next day. Group 1 planned to travel to the west side of US 550 and into the area around Senator Beck Mine. 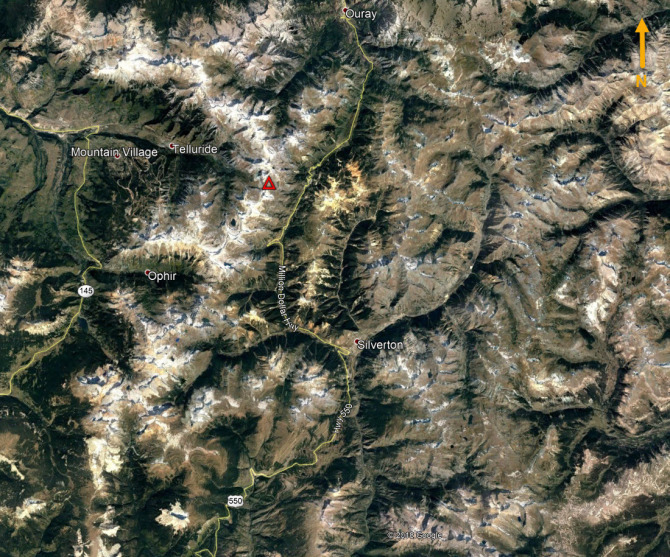 Group 2 would stay on the east side of the highway in the Prospect Gulch area. Group 1 spent about 2 hours planning their tour with their instructor (Skier 1). Eventually Skier 1 went to bed, but the rest of the group spent an additional hour on their plan for the next day. Saturday morning the two groups left the lodge for their day in the field. They met with a staff member of the Silverton Avalanche School, who relayed current weather information, the avalanche danger rating, and the avalanche problem list from the January 5 backcountry avalanche forecast issued by the CAIC. Group 1 descended to the highway, crossed, and headed toward Senator Beck Mine. Group 1 had a detailed trip plan that included a time schedule, a series of waypoints, and locations where they needed to make decisions. Their ultimate goal was to climb a peak locally known as South Telluride Peak (marked 13510 on USGS maps). They followed their planned route with a minor variation just below treeline. They stopped as planned at their first decision point, below a steep slope just above treeline. They decided that rather than ascend a snow-covered portion of the slope, they would ascended a slightly steeper section of the slope where grass was sticking out of the snow. 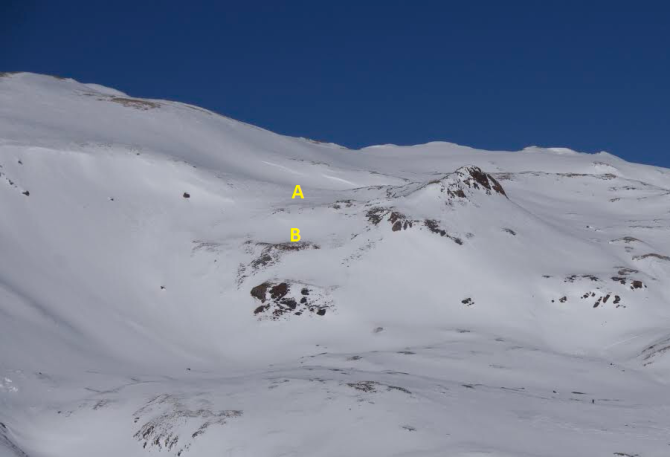 They used the shallow snow on the southeast aspect to reduce their exposure to avalanches. They continued up the drainage, making observations, and discussing the avalanche conditions. They observed a whumpf in a grassy area of shallow snow, but no other signs of instability. At about 12,700 feet they dug a snow profile on a southeast-facing slope and conducted a series of column tests. 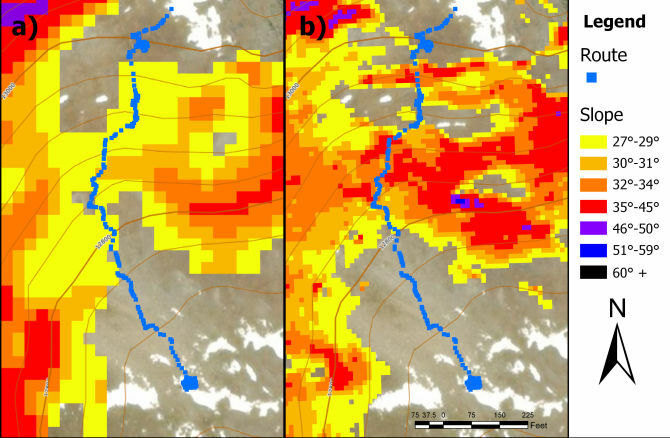 None of the tests highlighted instability on a specific layer or showed propensity for crack propagation (STN, CTN, ECTN. Both the ECT and CT broke 57 cm off the ground with continued blows from the shoulder) (AAA 2016). 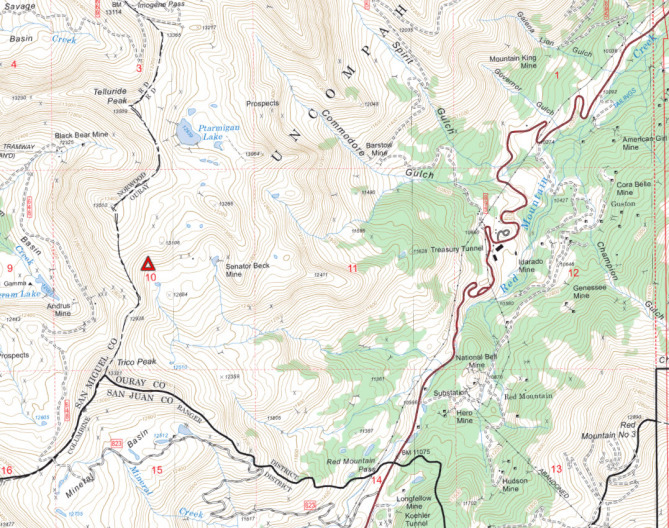 Their route continued uphill towards point 13106 to the west of the Senator Beck Mine. It was almost 2:00 PM and they decided it was time to look for a descent route and return to the highway. Their trip plan identified two descent options. The first was to descend the same way they had come up. The second was to descend the east side of a small cirque, travel to the northeast to their ascent route, and then descend the way they had come up. They decided on the second route. After climbing to the top of point 13106, they moved west to the low point of the saddle between point 13106 and the rest of the cirque. Their plan was to descend a south aspect with shallow snow to reduce the risk of avalanches. They discussed moving the group from the saddle to a mid-slope bench where grass was sticking out of the snow. From there they would descend the rest of the slope, before returning to their skin track for the rest of the descent. The group decided to travel down the first section to the bench in short succession. Skier 1 would start and when he was part way down, Skier 2 would follow. This would continue until the group was all on the bench. Skier 1 explained the plan and also where he wanted the group to travel on the slope, providing a boundary on the skier's right (west) for them not to cross. He began his descent. Skier 2 followed, traveling a little to the skier's right (west) of Skier 1. Skiers 3, 4, 5, and 6 all began sidestepping down the slope so they could see Skiers 1 and 2 as they descended. The snow surface was hard wind-packed snow. Skiers 3, 4, and 6 stopped to adjust equipment and get ready for their descent. Skier 5 continued to sidestep downhill. He saw a crack shoot across the slope and yelled "Avalanche!" The avalanche caught all six skiers. When the avalanche caught Skier 1, his ski bindings released and he fell forward, traveling head downhill on his belly. He was under the snow at times, but rose to the surface as the debris stopped. He lost both skis and one ski pole. He was carried to the bottom of the slope. When the first avalanche stopped, Skier 1 was partially buried--not critical (his head was not under avalanche debris). He stood up and saw a second avalanche coming at him from an adjacent slope. The debris from the second avalanche ran over the debris of the first avalanche, but stopped short of Skier 1. The first avalanche caught Skier 2 and carried him to the bottom of the slope. The rest of the group was preoccupied with their own involvement in the slide, so we do not know Skier 2's condition at the end of the first avalanche. The second avalanche overran Skier 2’s position in the debris of the first avalanche. The avalanche carried Skiers 3, 4, 5, and 6 between 15 and 20 feet downhill. The debris around them remained in large blocks, several feet thick and up to 12 feet wide. Skiers 3, 4, 5, and 6 stood up in the blocks of debris and looked around. They saw the second avalanche overrunning the debris of the first avalanche, but could not see Skiers 1 and 2. Skier 1 turned his avalanche transceiver to receive and began a search for Skier 2. Skiers 3, 4, 5, and 6 collected their equipment and began their rescue effort. They turned their beacons to receive and began moving downhill. They were in large blocks of snow that were difficult to negotiate. Eventually the four removed their skis and walked down the bed surface. 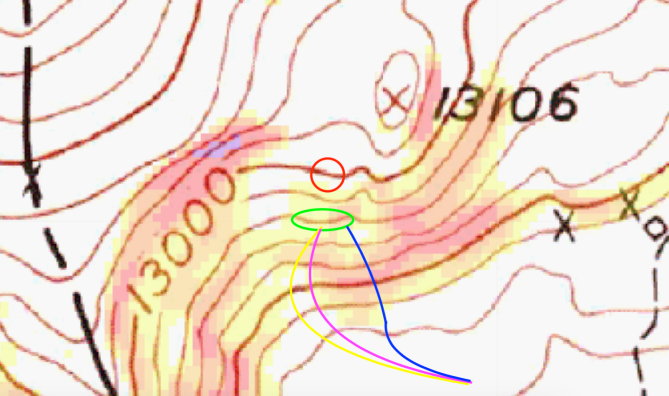 When they reached Skier 1, he was conducting the fine search portion of his beacon search with the lowest reading around 3 meters. Skier 1 asked Skier 4 to double check the location of the lowest reading on his beacon. Skier 4 did a fine search and got a reading of 2.7 meters several feet away from the first low point. Skiers 3 and 5 were at this location and assembling their shovels and probes. Skier 1 asked them to probe at the second low point and Skier 3 hit Skier 2 on the first probe strike. The group began digging around the probe. Skier 6 asked about the potential of a third avalanche striking their location. Skier 1 asked her to descend to a small knob outside of the debris pile to spot for the rescue effort. The group continued to dig using the conveyor-belt method. They reached Skier 2's backpack after about 25 minutes of digging. Skier 1 was showing signs of stress and fatigue from his ride in the first avalanche. He gave instructions to Skier 4 about the next steps of the rescue (Skiers 3 and 4 had completed a one-day rescue class with the Silverton Avalanche School, with Skier 1, on Thursday January 3). Skier 1 then swapped positions and roles with Skier 6. He used a radio to contact the St Paul Lodge at 3:21 PM. He reported the accident and asked for assistance. The group reached Skier 2's head, but he was buried face down, lying on his belly. His legs were uphill with a significant amount of snow on them. They checked for breathing and a pulse, but were unable to provide additional care without freeing Skier 2's limbs and adjusting his position. They extricated Skier 2 from the snow about 50 minutes after the first avalanche. They tried to revive him, but their efforts were unsuccessful. The group was in radio contact with people at St. Paul Lodge and knew a search and rescue effort, including a helicopter, was underway. They waited for about 45 minutes at the scene of the avalanche, but the group was very tired and it was getting dark. They headed for their ascent route and began retracing their steps towards US 550. Two rescuers in a Careflight helicopter landed near the Senator Beck study plot and made contact with the group. The rescuers discussed the situation with the group. It was getting dark, the group was fatigued, and distressed from the accident and rescue. Skier 1 did not have skis and they had about 1 mile and 1000 feet to descend. The rescuers gave Skier 1 some of their equipment and the group descended and reached the highway at about 7:00 PM. The rescue effort included members from Ouray County Search and Rescue, San Juan County Search and Rescue, La Plata County Search and Rescue, Careflight, and the Colorado Avalanche Information Center. Weather and avalanche conditions hampered efforts to recover Skier 2’s body. On January 8, Helitrax conducted avalanche hazard mitigation at the site to protect rescuers. This triggered a similar- sized avalanche between slides 1 and 2. Ouray County Search and Rescue recovered Skier 2’s body. All of the fatal avalanche accidents we investigate are tragic events. We do our best to describe each one to help the people involved and the community as a whole better understand them. We offer these comments in the hope that it will help people avoid future avalanche accidents. This accident is especially troublesome as it involved a group of well-trained and well-equipped people in an avalanche safety class. This was a class for people with previous avalanche education and some experience in avalanche terrain (AIARE 2). There was an instructor in this group whose role was to teach the group how to understand, observe, and analyze the avalanche hazard and navigate through avalanche terrain. This accident is more complex than most because it involved a relatively large group of people, in a very structured environment, executing a detailed trip plan. In addition to the group’s plan, the instructor made a plan for the course based on his knowledge of the area and current conditions. This experience included multiple days in the field earlier that week, working in the area since mid-December, and work in the area each year for the last six. The instructor had additional local information at his disposal including information exchanges with other guides, avalanche safety operations, and recreationalists in the area. A basic tenant of avalanche safety is to travel one-at-a-time through avalanche prone areas. This limits the exposure of the group to one person at each point in time and maintains the maximum number of rescuers in the case of an accident. In this event, six people were caught in one avalanche. Four were caught and carried. Two were partially or completely buried. Fortunately, the number of people caught did not limit the number of rescuers, but the group came very close to facing a rescue with multiple victims. By our estimate if Skiers 3, 4, 5, and 6 were a few feet higher on the slope the avalanche would not have caught them. If they were a few feet to the west, they may have been carried to the bottom of the slope. The group failed to plan and execute their descent in a way that minimized their exposure to a potential avalanche and that allowed the members to communicate. They chose to descend the first slope to the bench spaced apart, with multiple skiers on the slope. The waiting skiers had to side step over the break in slope to maintain visual contact with the descending skiers. The easiest way to stay out of avalanches on a backcountry tour is to pick a route that avoids the hazard. Wise avalanche people have said that on a specific day you can’t choose the weather or snowpack conditions, but you can choose the terrain you travel through. This could manifest as simply avoiding avalanche terrain. 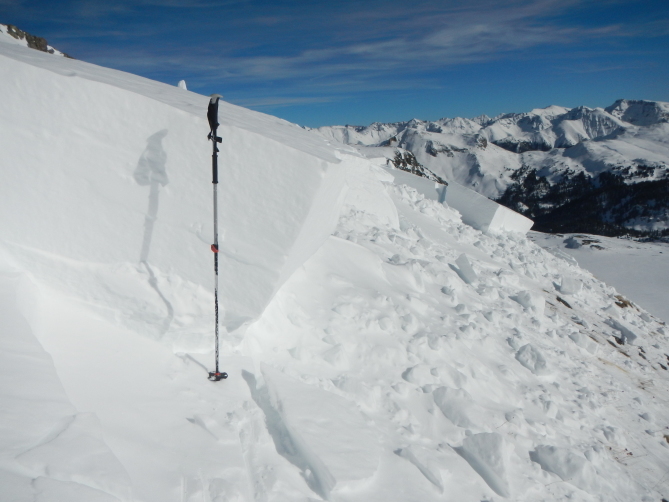 A more nuanced approach is to match the terrain you use to the current avalanche hazard. On this day, the group chose to avoid avalanche terrain; and for most of the day that is exactly what they did. 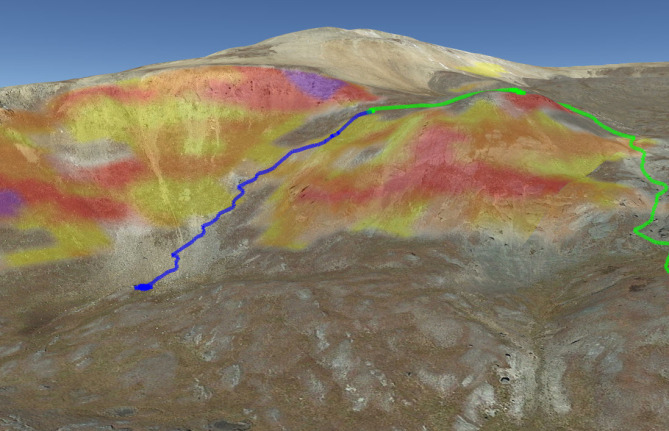 They identified an area where they needed to navigate avalanche terrain early in their tour. This was a fairly short slope, just above treeline, with a fairly consistent aspect, and minimal overhead hazard. They looked at a small, snow-covered area where the slope was not as steep, but instead used shallow snow on a southeast slopes to travel through the area without incident. Later in the day they tried to use a similar approach for their descent. 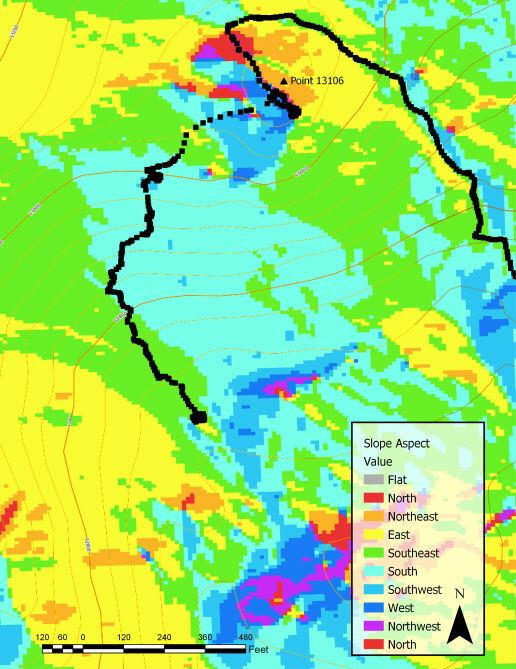 They identified a narrow section of the terrain in the cirque that was both south facing and had a lower slope angle than surrounding terrain. They descended this area and the results were tragic. What was different? The second terrain feature shares some similarities with the first. Before going into the details, let’s look at the terrain and the big picture avalanche issues for this day. The group’s planned route followed a terrain feature that provided a narrow area of “safe passage” below steep, east-facing slopes. There was significant overhead hazard and threat from the connected terrain. Perhaps most importantly, the runout areas for different sections of the cirque overlap. This was the first day the avalanche danger dropped below Considerable (Level 3) since December 26. 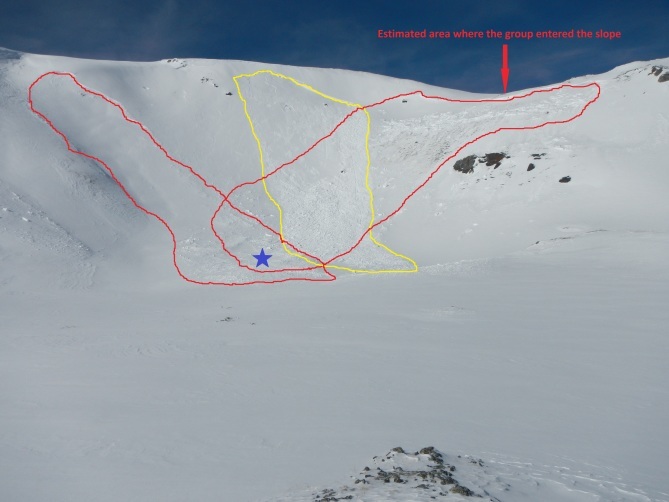 There had been significant avalanche activity during this time including avalanches with wide propagation, remote triggers, and avalanches repeating in paths that ran in previous storms. 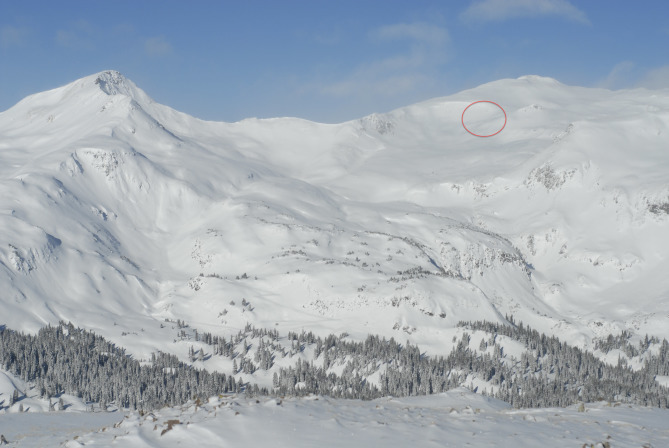 Relevant sections from the January 4 backcountry avalanche forecast include “Many recent avalanches were triggered from the bottom of the slope, from adjacent slopes, or from a distance. 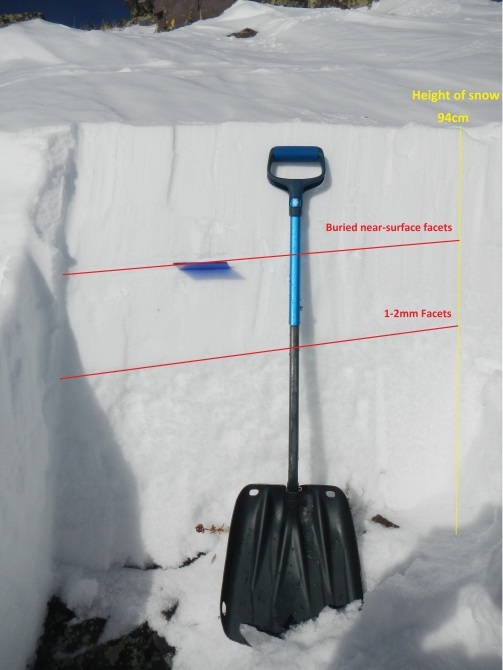 Triggering an avalanche in a thin area of an open slope prone to wind-loading may propagate over a large area.” and on January 5, “This provides clear evidence that you can trigger an avalanche breaking on buried weak layers today. You can trigger avalanches from the bottom of the slope, from adjacent slopes, or from a distance.”. 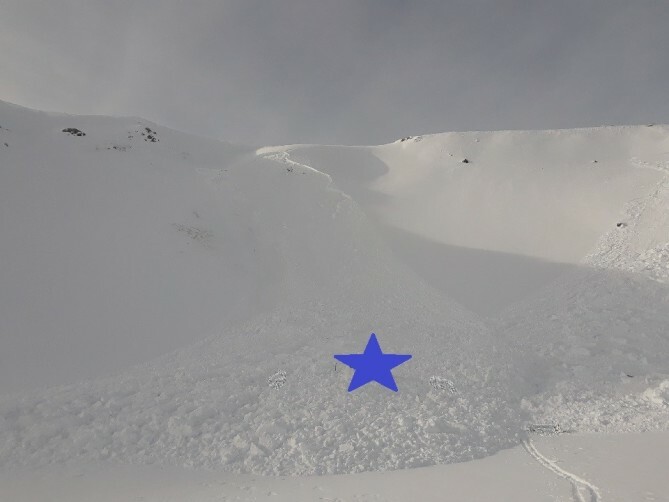 The specific avalanche conditions on January 5 did not support traveling on snow connected to a steep, east-facing slope that would run onto your path if it avalanches. There are two issues that came up while we were documenting this accident that we hope will help people use the CAIC forecasts to avoid accidents. The zone backcountry forecasts use three sections: Avalanche Danger ratings, Summary, and Avalanche Problems. We use these three components to communicate the avalanche conditions to you on days when they are simple and on days when they are complex. We use all three sections to convey the most important information. We strongly recommend that you use all three sections when you are trying to understand the avalanche conditions of the day. On the day of the accident, the group obtained the avalanche danger rating and avalanche problems verbally from a SAS staff member. They did not read, listen to, or discuss the contents of the Summary. Information on the potential for wide propagation and remote triggers was in the Summary section of the avalanche forecast, although there was a similar statement in the Summary of the January 4 that the group did read. The Summary also highlighted conditions along the US 550 highway corridor. 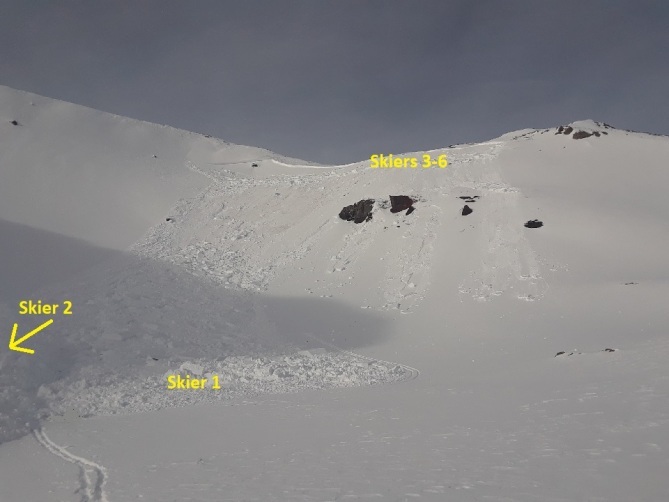 The location rose for Persistent Slab avalanches on January 4 highlighted west, northwest, north, northeast, east, and southeast aspects at all elevations as the most likely slopes to encounter this problem. This does not mean avalanches are impossible on other aspects, just less likely. The group was purposely traveling on what they determined was a shallow south-facing slope to avoid Persistent Slab avalanche conditions. During our visit to the site we measured the slope aspect where the group entered the slope at 160 degrees. The aspect of the terrain in the cirque rolls from due south to southeast, east, and eventually northeast. Although the group was traveling in the southern octant, they were very close to the southeastern octant and traveling below southeast and east facing terrain. We do our best to issue informative and accurate avalanche forecasts each day from November through May. Each avalanche forecast covers a very large area. The location rose, the other elements of the avalanche problem, and the avalanche danger rating are all descriptions of the patterns and trends we see at the regional scale. They will be most useful if you combine them with observations you make in and around the terrain you chose to travel in. “The bottom line is that your hazard evaluation decisions are only as good as the data you seek, integrate, and act upon” (Fredston and Fesler 2011). In discussions after the accident, the group described trying to avoid avalanche terrain. One of the ways they were doing this was by traveling on slopes with an angle less than 30 degrees. 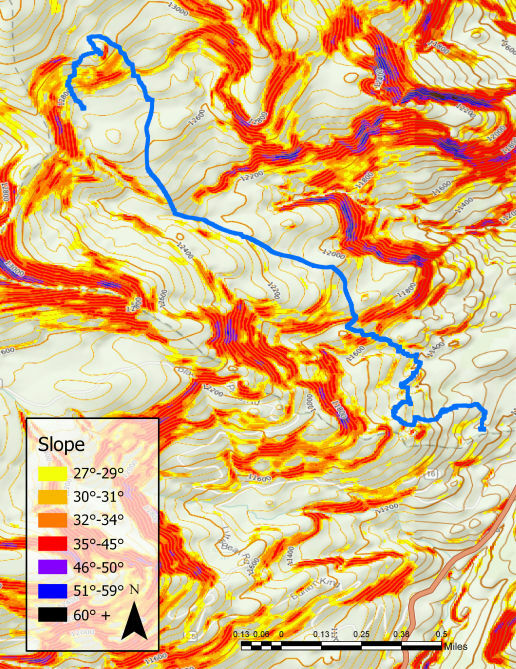 Looking at slope steepness was part of their trip planning process and they used common digital tools to look at shaded slope angle layers draped over terrain models or topographic maps. With the help of these tools, they avoided avalanche terrain for most of the day. They also identified the narrow terrain feature where they could keep their slope angle at or below 29 degrees as they worked through much steeper terrain. Their GPS tracks shows that they were either on or very close to their planned route. We measured slope angles during our visit to the accident site. Measured angles ranged from 32 to 34 degrees on the slope the group was descending when the avalanche released. This is only a few degrees steeper than the shading tools show, but in this case it may have been a very important difference. The group did not attempt to measure the slope angle before their descent. If they had, it is possible that they would have found this discrepancy. On some days and with some avalanche problems, the difference between 29 degrees and 32 degrees might not be significant. However, it can be significant when dealing with a Persistent Slab avalanche problem, especially when a remote trigger is possible. Skier 2 was wearing an airbag backpack. After the accident we determined that the system was functioning properly, the trigger out of the pack strap, but the bag was not deployed. Skier 3 was also wearing an avalanche airbag backpack. He pulled the trigger when he was caught in the avalanche. The airbag did not deploy. Later, he determined that he assembled the trigger mechanism incorrectly. A study on airbag effectiveness (Haegli et. al. 2014) found that 60% of non-inflations were due to users not triggering the bag, and 12% of non-inflations were due to user error like mis-assembly. Our investigation included several site visits and multiple interviews with the group and SAS staff. Search and Rescue volunteers, the group, local professionals, Caltopo, the Center for Snow and Avalanche Studies, the NASA Airborne Snow Observatory, and SnowEx provided imagery and data. We greatly appreciate all of their contributions. Fredston, J., and D. Fessler (5th Edition Edited by K.W. Birkeland and D. Chabot), 2011: Snow Sense: A guide to Evaluating Snow Avalanche Hazard, Alaska Mountain Safety Center, Anchorage, AK, USA, p 132. 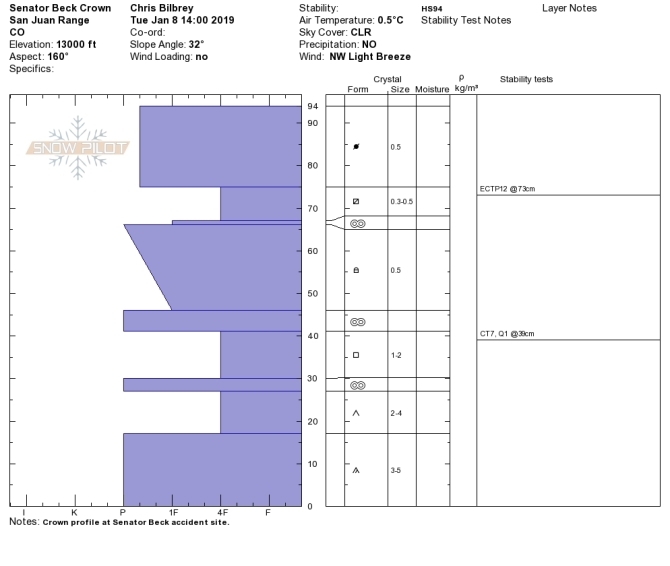 Figure 22: Crown profile (observed on January 8) of a skier-triggered avalanche that resulted in a fatality in upper Senator Beck Basin on January 5, 2019.